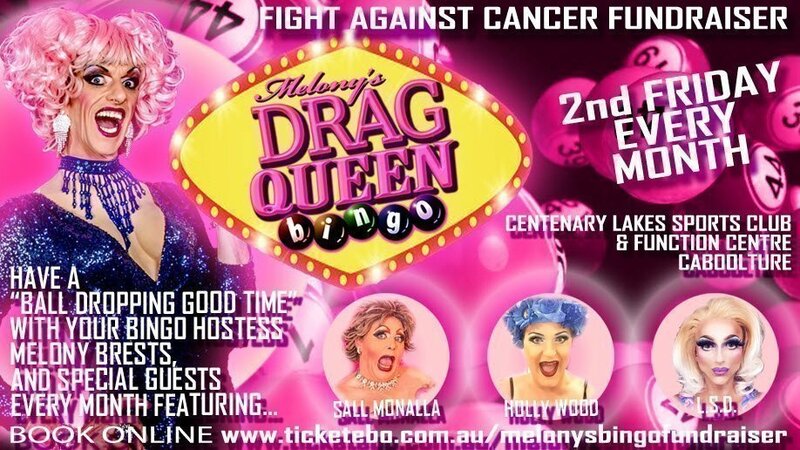 Second Friday Every Month Melony Brests heads a cast including special guests Sall Monalla, Holly Wood and L.S.D, as they bring Melony's Drag Queen Bingo back to The Centenary Lakes Sports Club, for the next Fight Against Cancer Fundraiser. With some not so normal bingo games full of cheeky innuendo and hysterical call out's, plus fabulous spot and production drag shows and crazy prizes It's a ball dropping good time. Aaand... It's for a great cause too... All proceeds from bingo book and raffle ticket sales are going directly to help continue treatment for a local living with cancer. If you haven't yet seen a Melonys Drag Queen Bingo show, you shouldn't miss this. 18+ event, contains coarse language, sexual references, drag queens behaving badly and may contain traces of nuts! Bingo Books are 3 for $5 or 6 for $10, and are available on the night, before the show commences. All Proceeds from bingo book and raffle ticket sales go directly to the Fight Against Cancer Fundraiser to help assist a local with on-going cancer treatment costs. 18+ Event, ID may be required.